Difference between Magicjack and Magicjack plus | Free Pc to Phone Calls, Free Voip Calls to India International ! MagicJack is a extremely popular device, simply because it offers free international calls to USA and Canada. The numbers also reflect the same, according to VocalTec 15 million people have been using MagicJack. Its been quite a time when first version of device was launched and the time has come for its newer version (a more advanced device). "MagicJack Plus" has now been released with noticeable differences from its predecessor Magicjack. The plan is capture the remaining market with the new device as it has some remarkable improvements. Many people are also expecting that the one already using the older version will switch to MagicJack Plus. Same scenario is seen with Apple device as well (when people sell of old iPhone and buy a new one). MagicJack old device is outdated in regards to its functionality and call quality so it was time for an update. Lets see how is MagicJack Plus different from Magicjack. You do not need a computer anymore, so magicjack service is just like your regular home phone service. Or may be a better service than your regular home phone does. No need to keep your computer turned on all the time. You can use any phone - be it corded, cordless, portable, DECT. Simply plug it into your new phone jack in the magicJack PLUS which can be plugged into the wall now. Of course you still have a choice to plug your phone into the magicJack PLUS when you want to use it with your computer when traveling, at a second house, at your business or even your home. Now you have a choice, and magicJack is the only one who gives you these choices. Plug the ethernet cord into the magicJack Plus unit and then into a high speed modem or router. The USB extender is then plugged into the power supply, and into the magicJack Plus. Any telephone can be plugged into the magicJack Plus, and users can immediately begin placing and receiving calls. No software installation is required. MagicJack Plus includes an on-board CPU. The reason MagicJack Plus is able to work as a stand-alone device, and why it doesn't need to be connected to a computer in order to make calls. Having an on-board CPU makes the MagicJack Plus so much better than the original magic Jack because it eliminates the need to include another device that can cause complications. The call quality is also better. Magicjack Plus is tagged with an initial purchase of $69.95. Power supply that is used when the device is being used as a stand-alone unit. This price also includes the user’s first year of service, which allows for free and long distance calls, as well as calls to Canada. International calls can be completed for an additional per minute cost, which varies from country to country. 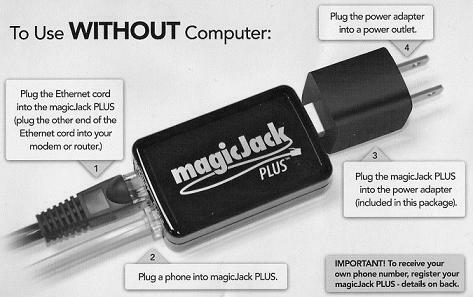 The original MagicJack Device could only work by being plugged into a PC that was connected to the internet. No computer, then no calls with Magicjack. With the MagicJack Plus, the device works without a PC, instead using an existing Wi-Fi connection. This means that you can hook the new magicJack directly into your current landline telephone and you will be up and running in just a few seconds. You can take the magicJack Plus with you when you travel outside of the USA country and you will have free calls back to the U.S. and Canada. No matter where you are in the world all calls to the U.S. and Canada are free. You can also consider buying magicJack PLUS for someone you know that lives overseas and give the gift of free calls to U.S. and Canadian Phone Numbers. So if you are in USA and have family in India, then it is time you gift them Magicjack Plus so that they can call you for free! Setup your old phone number to the new magicJackPLUS by setting up the porting procedure. Easy procedure. If you want to get a new Phone Number anywhere in the country, you can do that and even get a vanity number too. Some people have complained that they are having some issues in getting the device up and running. Sometimes the devices gives error codes while installation or when using. We have compiled a list of common error codes and solutions to them. Just follow the steps and get your device up and running. The magicJack Plus dongle does not work with WiFi as stated in your article. It must be connected into a router using an Ethernet cable the old fashioned way.